Transportation routes built for commerce developed slowly in eastern Pennsylvania, and it was not until after the American Revolution that some thought was given to open the upper river regions to transportation canals. Routes to the interior promised opportunity but bad roads limited development. Areas easily accessible by water, such as lower Bucks County, were settled first, and had a strong relationship to Philadelphia. Remote farming settlements far from navigable waters in upper Bucks and the Lehigh Valley remained isolated and developed small self-sufficient economies. Many of the settlers struggled to take advantage of local natural resources such as lime, iron, timber and slate, but lack of transportation restricted their use. Settlers did not move into the remote and difficult terrain north of the Blue Mountain until after the better agriculture lands of the Coastal Plain and the Piedmont had been settled. During this time the young city of Philadelphia was growing into a powerful political and economic center, and until 1825 was the largest city in North America. Transport of goods to markets there was critical to the development of the region's economy. Navigation was possible on the Delaware River as far north as Morrisville. Here, at the Falls of the Delaware, the Coastal Plain rises to the Piedmont, and rocks and river rapids form barriers to ships. Such barriers did not stop shipping completely: massive log rafts of felled timber and flat-bottomed Durham boats were floated down the Delaware and Lehigh rivers. The Durham boats were laboriously poled back upstream, although their limited size and the intensive labor required made this form of transportation expensive. The economic impetus for the development of reliable inexpensive transportation on a large scale occurred early in the 19th century. With the exception of small regions in Colorado and New Mexico, Pennsylvania contains the only anthracite coal regions found in the United States. Two ambitious Philadelphia entrepreneurs, Josiah White and Erskine Hazard, secured rights to thousands of acres of these anthracite coal lands. After they demonstrated the marketability of anthracite as a efficient fuel, they began to modify the Lehigh River for navigation. To bring coal from the mountains of Carbon County and later, the Wyoming Valley, the Lehigh Navigation System and the Delaware Canal were constructed. Built in stages from 1817 to 1845, the canals opened the region to exploitation. The canals were largely hand-dug by local farmers and Irish immigrants using picks, shovels, and wheelbarrows. The navigation system of canal and slackwater consisted of dams and locks of unprecedented size. The Lehigh Canal extended from Easton north to White Haven. The final connection to Wilkes-Barre was made by rail, and it included the remarkable set of three inclined planes near Ashley. The Delaware Division of the Pennsylvania Canal originally ran from the terminus of the Lehigh Navigation System in Easton south for 60 miles to Bristol. Today, the old boat basin and tidal locks are gone, but the canal is intact in Bristol and flows past the 19th-century Grundy Mill. Along the restored river front is the Colonial and Federal era core of the town, as well as Victorian mansions built during the industrial heyday, among them the Senator Joseph Grundy Mansion. The canals were most active during the 1830s to the 1860s. Even at the Lehigh Navigation System's peak in the 1850s, adjacent railroads began eroding the canals' business. To connect the Lehigh Navigation System to the Susquehanna River and the surrounding Wyoming Valley coal fields, the Lehigh and Susquehanna Railroad was extended over the mountains from White Haven north to Wilkes-Barre. 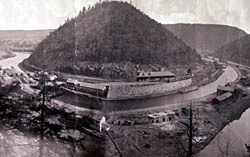 When much of the 22-mile upper grand section of the canal, from White Haven to Jim Thorpe, was destroyed by a flood in 1862, it was never rebuilt. 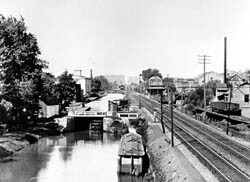 Use of the 47-mile lower canal slowly declined, and portions were in operation until 1942. It was America's last and longest-operated towpath canal. 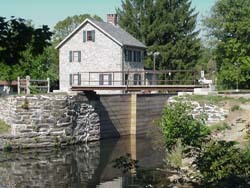 The Delaware Canal ceased operation during the Great Depression and is today significant as the most intact, accessible, and watered towpath canal in the nation. One hundred and sixty years later, much of the stonework of the canal's retaining walls and locks is still visible and the canal is capable of being fully watered.